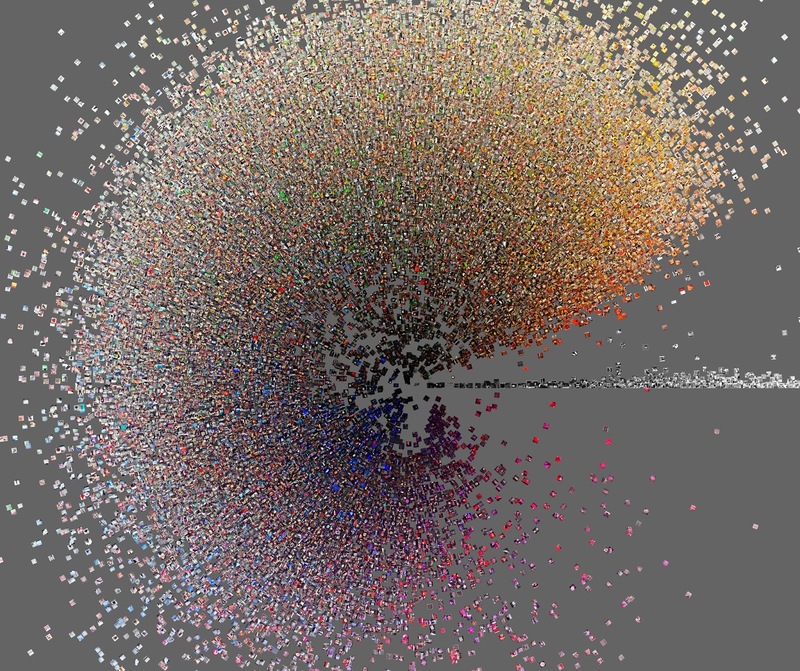 50,000 Instagram photos from Tokyo, organized by brightness mean (radius) and hue mean (perimeter). Detail. From the project Phototrails. Culture Analytics Institute (March 7–June 10, 2016) is bringing together more than 200 computer science and humanities researchers. The use of computational and mathematical techniques to analyze cultural content, trends and patterns is a rapidly developing research area spanning a number of disciplines. The goal of Culture Analytics program is to present best research and to promote collaborations. To do this, we are bringing together leading scholars in the social sciences, humanities, applied mathematics, engineering, and computer science working on qualitative culture analysis. The program is organized by Institute for Pure and Applied Mathematics (IPAM), University of California - Los Angeles (UCLA). 115 leading academic and industry researchers are speaking at 4 Institute workshops. Universities: UCLA, UCSD, UCI, UCSD, Berkeley, Stanford, USC, CMU, Chicago, Duke, Michigan, UT Austin, MIT, Yale, NYU, Brown, Rutgers, KAIST, CUNY, Cambridge, etc. Companies and research labs: Google, Facebook, Twitter, AT&T, Microsoft, NYT, NYPL, New York Hall of Science, Australian Center for Moving Image, Stamen Design, etc. 1. Culture analytics beyond text: image, music, video, interactivity, and performance. March 21–24, 2016. Yong-yeol Ahn (Indiana University), Sebastian Ahnert (University of Cambridge), Luis Alvarez (Universidad de Las Palmas de Gran Canaria), Jonathan Berger (Stanford University), Johan Bollen (Indiana University), Lawrence Carin (Duke University), Damiano Cerrone (SPIN Unit – Estonian Academy of Arts), Meeyoung Cha (Korea Advanced Institute of Science and Technology (KAIST)), Edwin Chen (Twitter), Ronald Coifman (Yale University), David Crandall (Indiana University), Kate Elswit, Elena Federovskaya (Rochester Institute of Technology), Marco Iacoboni (University of California, Los Angeles (UCLA)), Yannet Interian (University of San Francisco), Tristan Jehan (Massachusetts Institute of Technology), Lindsay King (Yale University), Lev Manovich (The Graduate Center, CUNY), Daniele Quercia (Yahoo), Miriam Redi (Yahoo), Babak Saleh (Rutgers University), Brian Uzzi (J. L. Kellogg Graduate School of Management). 2. Culture analytics and user-experience design. April 11–15, 2016. Taylor Arnold (AT&T Labs-Research), Seb Chan (Australian Centre for the Moving Image), Dana Diminescu (Telecom ParisTech and Maison des Sciences de l'Homme), Dan Edelstein (Stanford University), Sara Fabrikant (University of Zurich), Danyel Fisher (Microsoft Research), Mariah Hamel (Plotly), Francis Harvey (Universität Leipzig), Marti Hearst (University of California, Berkeley (UC Berkeley)), Lilly Irani (University of California, San Diego (UCSD)), Anab Jain (Superflux), Isaac Knowles (Indiana University), Isabel Meirelles (OCAD University), Doug Reside (New York Public Library), Eric Rodenbeck (Stamen Design), Carrie Roy (University of Wisconsin-Madison), Dan Russell (Google), Steve Uzzo (New York Hall of Science), Ben Vershbow (New York Public Library), Amanda Visconti (Purdue University). 3. Cultural patterns: multi-scale data-driven models. May 9–13, 2016. Lada Adamic (University of Michigan), Edoardo Airoldi (Harvard University), Sinan Aral (Massachusetts Institute of Technology), Maria Binz-Scharf (City University of New York (CUNY)), Joshua Blumenstock (University of Washington), Aaron Clauset (University of Colorado Boulder), Peter Dodds (University of Vermont), Tina Eliassi-Rad (Rutgers University), Aram Galstyan (USC Information Sciences Institute), Rayid Ghani (University of Chicago), Sharique Hasan (Stanford University), Eitan Hersh (Yale University), Matt Jackson (Stanford University), Jure Leskovec (Stanford University), Steve Lohr(The New York Times), Filippo Menczer (Indiana University), Mark Newman (University of Michigan), Molly Roberts (University of California, San Diego (UCSD)), Daniel Romero (University of Michigan), Don Rubin (Harvard University), Cynthia Rudin (Massachusetts Institute of Technology), Don Saari (University of California, Irvine (UCI)), Jasjeet Sekhon (University of California, Berkeley (UC Berkeley)), Cosma Shalizi (Carnegie-Mellon University), Limor Shifman (University of Southern California (USC)), Arun Sundararajan (New York University), Timothy Tangherlini (University of California, Los Angeles (UCLA)), Johan Ugander (Stanford University), Hal Varian (Google Inc.). 4. Mathematical analysis of cultural expressive forms: text data. May 23–27, 2016. Yong-yeol Ahn (Indiana University), Mark Algee-Hewitt (Stanford University), Ricardo Baeza-Yates (Yahoo! Research), David Blei (Columbia University), Tanya Clement (University of Texas at Austin), Brian Croxall (Brown University), Cristian Danescu-Niculescu-Mizil (Cornell University), David Garcia (ETH Zürich), Lise Getoor (University of California, Santa Cruz (UC Santa Cruz)), Ryan Heuser (Stanford University), Natalie Houston (University of Massachusetts Lowell), Matt Jockers (University of Nebraska-Lincoln), Dan Jurafsky (Stanford University), Ralph Kenna (Coventry University), Kristina Lerman (University of Southern California (USC)), Hoyt Long (University of Chicago), Winter Mason (Facebook), David Mimno (Cornell University), Suresh Naidu (Columbia University), Chris Potts (Stanford University), Lisa Rhody (George Mason University), Vwani Roychowdhury (UCLA), Noah Smith (Carnegie-Mellon University), David Smith (Northeastern University), Neel Smith (College of the Holy Cross), Richard Jean So (University of Chicago), Markus Strohmaier (Universität Koblenz-Landau), Timothy Tangherlini (University of California, Los Angeles (UCLA)), Ted Underwood (University of Illinois at Urbana-Champaign), Hannah Wallach (University of Massachusetts Amherst).